I consider myself to be quite opportunistic, readily willing to identify and take advantage of the potential benefits of any given circumstance, no matter how bleak or uncomfortable they appear from the outside. This being said, I got to thinking about one of the most popular commercial substrates for commercial oyster mushroom (Pleurotus spp.) production, straw, and whether or not the old, dried, fibrous stalks and leaves of various wild or naturalized grass species could be used in much the same way as straw derived from commercial cereal grain crops. So I decided to put on my mushroom cap and put this one to the test myself. I’ve written plenty about oyster mushrooms already (including my last post about pasteurizing your straw/sawdust substrate without using heat which you can check out right here) but there is no getting bored with such an adaptable, fast-growing species as Pleurotus ostreatus and/or P. columbinus. I’ve known for a while that one can grow both of these species as well as several of their kin on pasteurized* straw, but I didn’t really think critically about the composition of straw until just recently and what that means to the potential at-home mushroom grower. Straw is essentially the dried, leftover stalks and fibrous parts of different grasses after they have finished their life cycle and distributed their seeds. Often, the stalks of commercially important staple grain crops such as wheat, barley and rye are harvested when dry, baled together with twine and used for a variety of different purposes around homes and farmsteads alike. 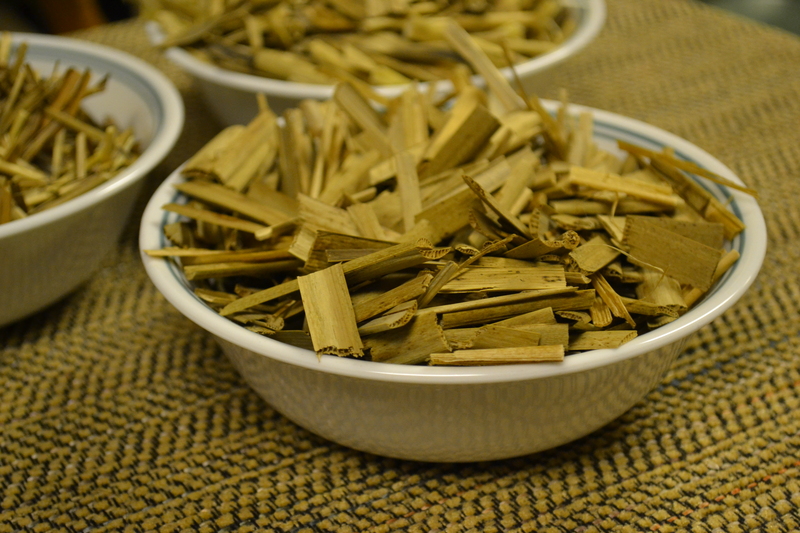 A bowl of freshly harvested and chopped cattail (Typha angustifolia) leaves and stalks ready to be pasteurized. In the background are separate bowls containing the other two subjects; the ornamental Miscanthus sinensis and invasive Phragmites australis. My initial thought that got the gears turning on this one was ‘who says that only straw derived from commercial grain crops is suitable for growing oyster mushrooms?’. It seems to me that straw collected from just about any grasses species should work, but very few wild species have been tested in this manner, at least to my knowledge. With no shortage of possible test species, I set out to locate some patches of dry grasses that were abundant in my locality. With out too much difficulty I identified three potential subjects, common cattail (Typha angustifolia), common reed (Phragmites australis) and a naturalized ornamental grass known as eulalia (Miscanthus sinensis) and set about harvesting them and chopping/cutting the stalks and fibrous leaves into roughly 3 or 4 inch long segments. This processing allows the mushroom mycelium to populate and digest the pasteurized* straw easier than if it were in long, tangled pieces with larger gaps between them. Smaller fragments can be stuffed and compacted together with greater consistency, all helping to speed up colonization and prevent baddies from gaining a foothold. The procedure that I followed was pretty straightforward. 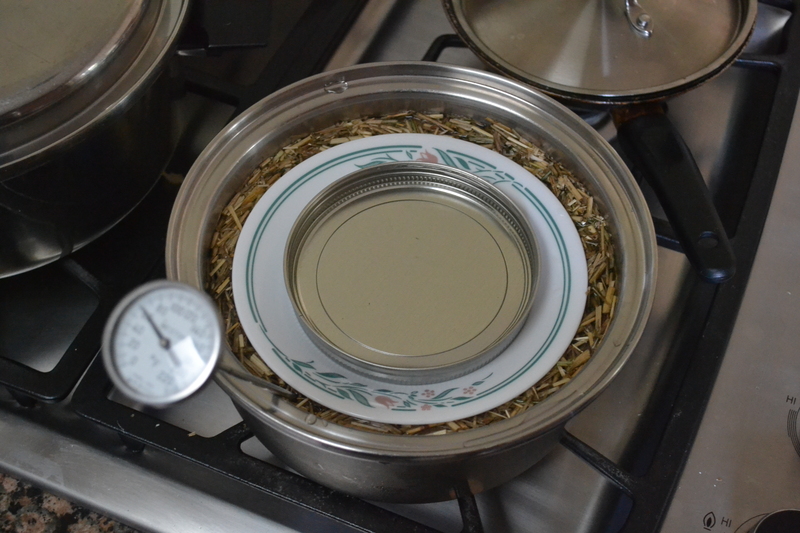 I pasteurized each of the different grasses in their own pot on the stove and maintained the water temperature the best I could between 160-180 °F for slightly more than an hour, using a thermometer. During the hour, the pot that contained the Phragmites accidentally got to near the boiling point, likely more than 210 °F. This means that many or all of the beneficial bacteria that are normally present after the pasteurization process if it’s done correctly may not be present at all for this specimen. Only time will reveal if the Phragmites becomes contaminated or results in a failed attempt at colonization altogether. After pasteurization, I poured the straw out of each pot, on species at a time, into a clean metal colander to cool down and drain. I feel that I allowed each species to cool and drain enough judging by the fact that the oyster mushroom cuttings that I placed in each bag before feeding in the straw began showing signs of activity less than 48 hours than being introduced to the substrate. I don’t think I let the Typha drain for long enough though, because there is a bit of actual moisture accumulating in one corner of the bag. As long as I try to keep this pooled moisture away from the actual mycelium I may avoid undesirable anaerobic conditions becoming a problem, but it’s best to avoid this entirely if possible and make sure your substrate has been adequately drained of excess moisture. Two stem cutting of Pleurotus ostreatus in the bag contained chopped and pasteurized Miscanthus sinensis ‘straw’. After 2 days inside of the bag, the cuttings are responding to the available energy source and humidity by developing new mycelial filaments. The cuttings that I used to impregnate the straw with mycelium were taken from ordinary oyster mushrooms (presumably Pleurotus ostreatus) that I bought at a grocery store the very same day as I conducted this whole process. I used a clean kitchen knife on a clean cutting board to cut off the largest portions of the base from which the stem and cap grew from. I had to tear some clusters apart because there were 6 or 7 mushrooms all clumped together and I then cut up the bases into 1-1.5” cubes. 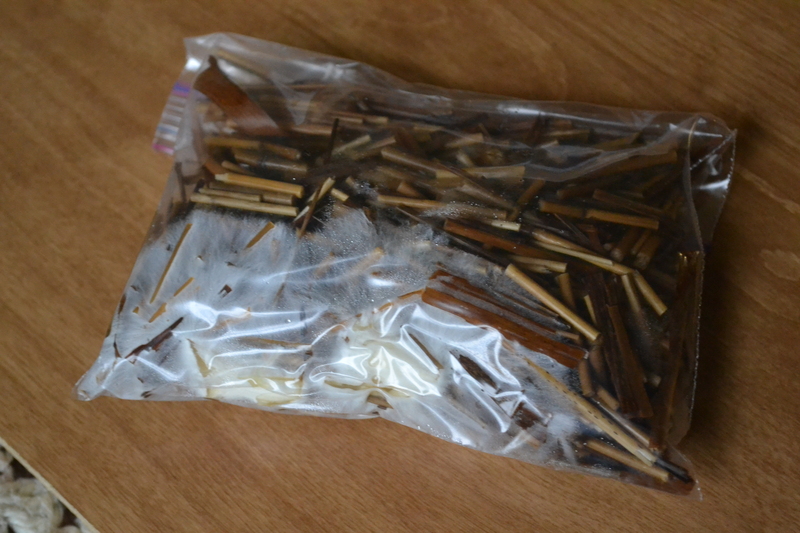 I placed each basal cutting in a Ziplock bag with my hand and then added each species of grass to each bag. Since there were 3 different grass species that I was testing, I have 3 separate bags that each contain a transfer of mycelium from the store bought mushrooms and a grass species as a growing medium. I made sure to put the straw in each bag when it was still warm, but not too warm, and soon after sealing the bags noticed quite a bit of condensation forming on the inside of the bag, indicating a humid environment which many mushrooms love and will refuse to grow without. A photo of the same Miscanthus sinensis bag as above, but taken 6 days later. The mycelium has spread out considerably further inside of the bag. If the environment inside of the bag is favourable, oyster mushroom mycelium can completely colonize the substrate within 1-3 weeks depending on the health of the mycelium, the ambient temperature and other variables. 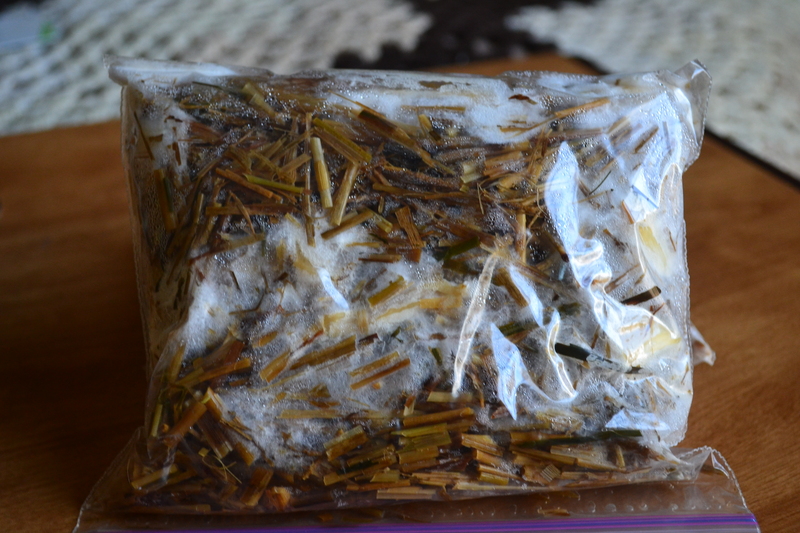 After 2 days in their bags, resting upright in a clementine crate covered with a clean kitchen towel and stored in the dark inside a cupboard at roughly 65-70 °F, the cuttings had become considerably fuzzy, an indication that actively growing mycelium is responding to the favourable conditions inside of their Ziplock enclosures. After 6 days, the mycelium in all 3 bags had spread to envelope what I believe to be 25-40% of the substrate inside. The mycelium in some of the bags is growing faster/performing better than others, but at this point in time I am not sure enough to claim that one substrate (whether Miscanthus, Phragmites or Typha) is performing to such an extent as to be deemed ‘statistically significant’. However, on the 14th day of growth the differences between the different species became much more apparent and revealed issues that will/could be resolved through further experimentation. This bag contains wheat straw and was inoculated with several pieces of oyster mushroom mycelium. 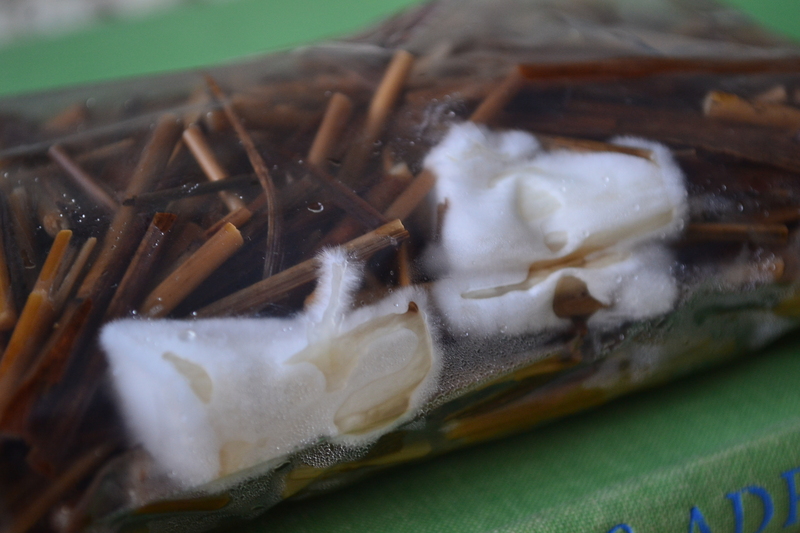 8 days after preparing this bag, ‘islands’ of mycelium are developing and growing into each other. My hypothesis is that this method will be in many ways superior than adding only one stem cutting which then must colonize the entire substrate but only from one central point which leaves patches of substrate uncolonised for longer periods of time. Miscanthus sinensis has performed the best out of all of the species, although this may not exclusively be due to the fungi’s preference but to other variables such as moisture content. Phragmites and Typha have a little too much moisture content, as is evident by the brownish water that has collected on the bottom of their bags. I’m sure that I’m not being too careless if I were to assume that the pooling water is negatively impacting the growth of the mycelium. Also, Miscanthus ‘straw’ is considerably smaller and has more surface area (even without being cut at all) when compared with Phragmites and Typha. In the next phase of experimentation, I am most definitely going to cut up the straw from reach species quite a bit more than I did this time around, as well as add multiple stem cuttings to the bags from various Pleurotus donors so as to ensure that there is enough mycelium present to quickly colonize the substrate. Various points of mycelium will grow into each other over time, ensuring faster colonization than if the mycelium originated from one point in the mass only. – Allow straw to dry out more/have a longer draining time than I allotted during this experiment. – Chop straw into smaller and finer pieces to allow for more surface area exposure and therefore, theoretically, faster mycelial spread. – Introduce multiple pieces of oyster mushroom stem cuttings so as to allow ‘islands’ of mycelium sources to envelop and grow into each other. – design a method which allows for some air exchange in the bags while also keeping ‘baddies’ out, for weak, pale mycelium (which was evident in the Typha and Phragmites bags more so than Miscanthus) may indicate a lack of oxygen. Oyster mushrooms can tolerate high carbon dioxide environments but even they have a limit to their tolerance. * If you would like to learn more about the pasteurization process and how you can very easily do it yourself without any fancy equipment, then check out my previous post.